Sweet Potato Mash - Combine sweet potato, garlic steak splash, orange juice, and 1 cup water in saucepan; season with salt and pepper. Bring to a boil, reduce heat, and simmer until sweet potato is very soft and liquid has evaporated, 20-25 minutes. Remove from heat and mash. Let cool slightly. Do ahead: Sweet potato mash can be made 3 days ahead. Cover and chill. Broccoli and assembly - Preheat oven to 425F. Toss broccoli and 2Tbsp. oil on a rimmed baking sheet; season with salt and pepper. Roast until tender, 15-20 minutes. Let cool, then coarsely chop. Meanwhile, brush both sides of bread with 2 Tbsp. oil and toast on a baking sheet until golden brown, 6-8 minutes. Toss broccoli, nuts, lemon juice, half of basil and mint, and remaining 4 Tbsp. oil in a large bowl; season with salt and pepper. 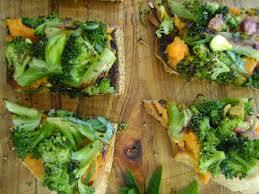 Spread toasts with sweet potato, top with broccoli mixture and remaining basil and mint, and sprinkle with sea salt. Cut into pieces.